Fast facts, incredible info, and tantalizing trivia about the heroes and villains of the whole DC Comics Universe. 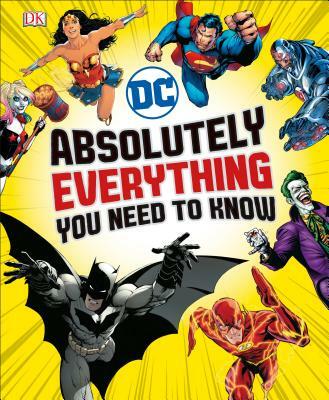 The latest title in a bestselling series, DC Comics: Absolutely Everything You Need To Know has the lowdown on everyone's favorite DC Comics Super Heroes and Super-Villains, including Superman(TM), Batman(TM), Wonder Woman(TM), The Flash(TM), Green Lantern(TM), Aquaman(TM), and The Joker(TM). The infographic design of each spectacularly illustrated, double-page feature gives readers a totally new slant on the DC Comics Universe and its super-powered heroes and villains, fantastic weapons, futuristic technology, strange planets, exotic places, and alternate worlds. The punchy, accessible text incorporates key data, fun facts, lists, quotes, and amazing stats, spanning 80 years of DC Comics Super Hero thrills. Information is presented in exciting box styles and illustrated with DC Comics artwork. Themed boxes capture the essence of characters or topics by pinpointing their most unforgettable aspects. Discover Superman's strangest powers and Batman's top death-defying escapes! Find out who wins when Wonder Woman and Cheetah(TM) go head to head. Check out The Joker's best and worst days! Learn the greatest secrets of Aquaman's undersea kingdom Atlantis! Explore the darkest corners of Arkham Asylum and Apokolips! These and many more eye-popping revelations and strange, intriguing insights await readers of DC Comics: Absolutely Everything You Need to Know--a book that will inform, delight, and enthral DC Comics fans of all ages. Copyright © 2018 DC Comics.